Apple is continuing to add “Your Verse” featurettes to promote the various ways people are taking advantage of the iPad as a platform for work and play. The latest two spotlight videos, which I learned about through iClarified, focus on Esa-Pekka Salonen and Chérie King. 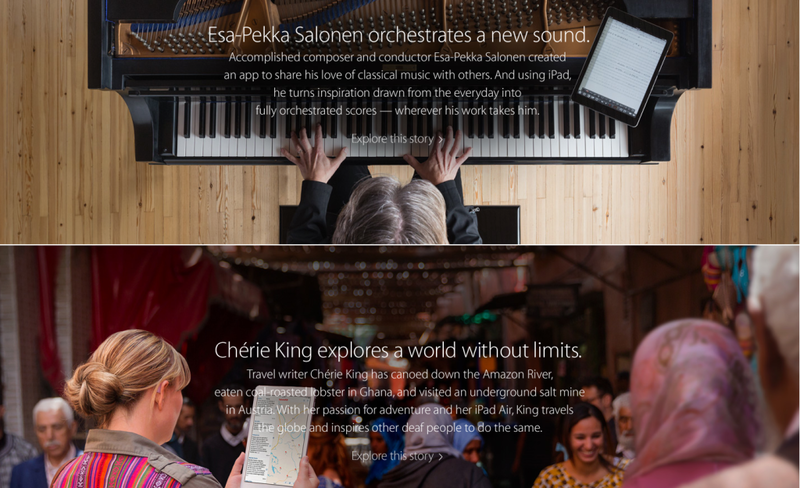 Esa-Pekka Salonen uses his iPad to help him compose whenever inspiration strikes, and Chérie King uses her iPad as an all-around traveling tool to help with photography, sharing content, and navigating landscapes and languages. In typical Apple fashion, the featurettes are fun and beautifully shot, but I like the little bit of extra detail that Apple has added this time around. If you were ever curious about exactly which apps were used in the videos — or even which other apps people like Esa-Pekka or Chérie may use — Apple has now grouped all of them in a convenient custom App Store page for easy viewing (e.g. Esa-Pekka Salonen’s favourite apps). It’s this kind of dynamic marketing that really sets Apple apart, and I’m looking forward to seeing more of it.